If the Mumbai terror attacks were intended to stir up trouble between Pakistan and India, they certainly succeeded. It is truly amazing that after a barbarian terrorist attack was launched from its soil, Pakistan is threatening India rather than apologizing. it is totally unacceptable. Amid growing tensions between India and Pakistan following the 11/26 Mumbai terror attacks, Pakistani nuclear scientist Dr. Samar Mubarakmand spoke of the readiness of Pakistani missiles and of their capability to target Indian cities. 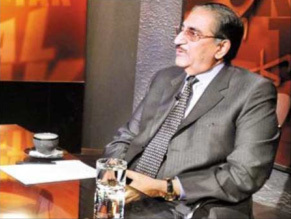 Dr. Mubarakmand, who has steered the Pakistani nuclear program for the past several decades alongside disgraced nuclear scientist Dr Abdul Qadeer Khan, expressed his views during a talk show. "Pakistan's nuclear assets are in safe hands. "I am very satisfied with the defense preparedness. As long as [we] didn't have nuclear weapons, India had a three and a half advantage [over Pakistan]. But this advantage was levelled when we conducted the nuclear testing. "Our missile system is ready, [and] can be fired in only 10 minutes - they are on the launchers..."